These quick and easy Grilled Mongolian Chicken Lettuce Wraps are packed with tons of flavor, so light yet so filling. A delicious, gluten-free meal for those busy weeknights! Deciding what to cook for dinner can be a daunting task – but it doesn’t have to be like that. Beat the weeknight dinner blues with this super easy Grilled Mongolian Chicken Lettuce Wraps. These lettuce wraps are light, fresh and have so much flavor that you won’t even realize you’re eating a low-carb and low-calorie dinner tonight. Today’s recipe – Grilled Mongolian Chicken Lettuce Wraps is made possible by P.F. Chang’s® Home Menu sauces – Mongolian flavor. The flavors of P.F. Chang’s® Home Menu Mongolian sauce will completely rock your recipe. This BBQ style sauce with a blend of soy sauce, white wine and garlic is truly addictive and yum!! and make a quick weeknight meal too! For this recipe, grilled chicken and sauteed veggies smothered in an incredible P.F. Chang’s® Home Menu sauces are served over a bed of fresh lettuce leaves. You will love P.F. Chang’s® Home Menu sauces on just about everything from fresh veggies to any kind of meat. 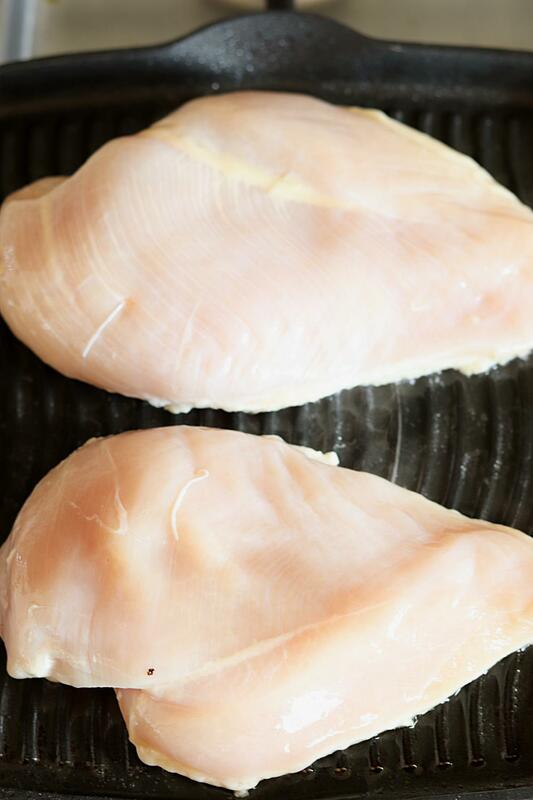 Start the recipe by grilling chicken breasts. Grilled chicken adds a robust-flavor to these lettuce wraps. Meanwhile, cook all the veggies until al-dente (vegetables should be crisp-tender). Feel free to add whatever veggies your heart desires – get creative and add more color and texture to these wraps. Once the chicken is cooked, remove from heat and cut the chicken into small cubes. Toss chicken cubes in the sauce, combine it with veggies and mix well. Heap the filling onto crunchy lettuce leaves and enjoy! You and your family will just love the texture and flavor of these wraps! This is a delicious make-ahead recipe! Saute veggies and chicken separately. Store them separately in the refrigerator. When ready to eat, stir in P.F. Chang’s® Home Menu sauces and mix. Assemble right before serving so that the lettuce leaves don’t wilt. Any leftover filling makes a great lunch next day. Reheat the filling and serve it with brown/white rice for a healthy next day meal. Another popular option would be – butter-head bibb lettuce and iceberg lettuce. This delicious and versatile P.F. Chang’s® Home Menu sauces can be purchased at your local Walmart store. This product is NEW to stores, and is available in these existing flavors: Teriyaki, Kung Pao, Sesame + Soy or Mongolian. So if you are headed to your nearby Walmart store then look for P.F. Chang’s® Home Menu sauces in their “Asian foods section”. I hope you give this crunchy and flavorful lettuce wraps a try and if you happen to make these wraps then share your pics with me @facebook or tag me by using the hashtag #ruchiskitchen (one word) on social media. Would love to hear back from you and would love to see your yummy pictures! P.F. Chang’s and P.F. Chang’s Home Menu® are registered trademarks owned by P.F. Chang’s China Bistro, Inc. and are used with permission. P.F. Chang’s® Home Menu Mongolian sauce. Wash chicken thoroughly under cold water. Grill chicken on the hot griddle. Until fully cooked and browned. This will take 20 minutes on medium heat. Remove from heat and allow it to cool. Return chicken to a skillet. And pour in 1/4 cup of P.F. Chang’s® Home Menu Mongolian sauce. Heat olive oil in a pan, add ginger garlic paste. Add green beans and cook for a minute. I have added green beans for extra crunch but fee l free to add veggies of your choice. Add carrots and cook for a minute. Add bell peppers and cook until the veggies are al-dente (vegetables should be crisp tender). Pour in the remaining 1/4 cup of P.F. Chang’s® Home Menu Mongolian sauce and mix it well. Mix together chicken and veggies. Add salt, red pepper and mix it well. Grilled Mongolian Chicken is ready. Enjoy it over a bed of brown rice or white rice. And serve immediately before the leaves start to wilt. Since we are vegetarians what would be a good substitute for chicken? Ami, you can substitute chicken for Tofu or Paneer (Indian cottage cheese).